Jeff Whetstone's connection to the land, love of history and susceptibility to romance brand him along with other great photographers-especially the sons and daughters of the South. The first time that I saw this image, I was spellbound. Listed on his website under the heading Human, this image defies being fully identified.The viewer's gaze is interrupted by only having access to the back of the sitter. 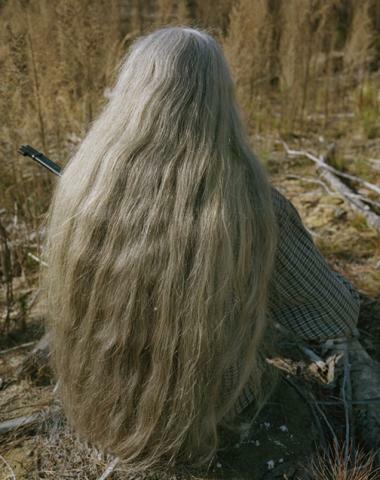 What we do know comes from the barrel of the gun to the left, the plaid covered arm on the right and that enveloping hair that glistens and shields (to the point of camouflaging) the sitter's body. This, along with Whetstone's characteristic naturalistic vista creates an image (and narrative) that is at once classic and defiant similarly to that of Lorna Simpson's Waterbearer (1986) seen below. Both subjects reflect on female workers in art history-mainly those in the paintings of Vermeer. Simpson's standing woman pours water from two distinct vessels, she wears a generic, white shift dress and a single bracelet. Her hair-partially braided, subtlety glistens against a dense, black background that mostly camouflages. The viewer's gaze is also interrupted as we are only permitted to view the Waterbearer from behind. The text beneath Simpson's image reads like a cautionary tale, yet the subject is no more a victim than Whetstone's seated huntress. Both have seen, witnessed and conquered and in the end, each woman retains a degree of control over her identity, thoughts and history.